Quest for the Arab Startup Formula: What is so great about this pic? But I still think this is a great pic. Why? 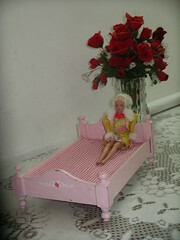 This Barbie bed was designed and built by a Syrian carpenter around 10 years ago. It's part of a full Barbie-room, made locally from wood - a lot like real furniture. The greatness of this humble piece is the spirit behind it. We've always seen Barbie and its very expensive accessories. We've seen the cheap Chinese frail replicas. But, instead of the consumerism-mentality of importing them and re-selling them in the market, this carpenter had a creative-mentality of building his own and entering the competition. This carpenter went out of his daily routine of making full-size couches and beds and was thinking out of the box. There are many carpenters in many other cities, but I rarely see them expand beyond the traditional. Where does this creative-spirit come from? The spirit of “I am ABLE - and I can make it better”? And how come I don’t see it in other cities? What makes Damascus so different from, let’s say, Kuwait city? or even Amman? He forgot the mattress. I don't think Babrie is going to sleep comfortably on this bed. :-) nice catch... but actually, the red-and-white striped thing is a thin mattress inside the bed.